Both the Met and the Moma (The Metoplitian museum of Art and Muesum of Modern Art for non-new yorkers) are so awesome and yet static that you really only go very rarely UNLESS – they have a special exhibit — and the Met’s exhibit of the Stein’s personal collection (as in Gertrude Stein, and her brother’s and sister) is pretty amazing — esp since these are the people that basically created the modern concept of a Salon as we know it today. Even more amazing is that the vast majority of the art they owned, they personal got from the artist — or arranged swaps so that they could afford the work of art. Where we can read Gertrude Stein writing Riba-Rovira “will go farther than Cezanne…will succeed in where Picasso failed…I am fascinated ” by Riba-Rovira Gertrude Stein tells us . But Gertrude Stein spoke also in this same document about Matisse and Juan Gris .And we learn Riba-Rovira went each week in Gertrude Stein’s saloon rue Christine . Coming from San Francisco “Seeing five stories” to Washington and now in the Metropolitan Museum of Art of New York for our pleasure . 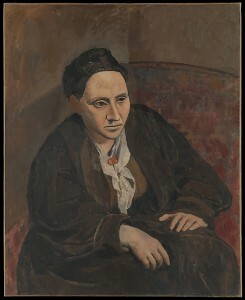 You have the translate of Gertrude Stein’s Riba-Rovira Preface on english Gertrude Stein’s page on Wikipedia and in the catalog of this exhibition you can see in first place the mention of this portrait .And also other pictures Gertrude Stein bought him .